The Ordinary are far from ordinary with their skincare ethos, founded to keep honesty and integrity at the heart of their products, instead of marketing schemes and buzzwords. If you're after high-quality but affordable skincare products, packed full of potent ingredients, then look no further than The Ordinary. The Ordinary was formed by umbrella brand DECIEM, which operates more than ten beauty brands including Hylamide and NIOD. DECIEM specialise in functional beauty; products which actually work and are backed by science. They believe that the beauty world has become stagnant, so aim to innovate and create products which no one else are making, whilst maintaining exceptional quality. The Ordinary benefit from the research and developments already made by DECIEM which is part of the reason they're able to keep prices so low. The Ordinary offer high-quality skincare products, with no gimmicks and no marketing ploys. You'll never see words such as 'anti-ageing' when it comes to The Ordinary, they simply show the ingredients they're using and explain the scientific benefits for the skin. For this reason, creating a routine with The Ordinary can seem daunting at first, but with research you can quickly find out which products would suit your skin type and can soon start feeling the benefits of the highly concentrated ingredients. Using high concentrations of potent ingredients no longer needs to be an expensive way to build an effective skincare routine. Skincare from The Ordinary doesn't follow the typical 'cleanse, tone, moisturise' method and instead focuses on treatments, vitamins and direct acids, which can completely transform your skin. Click here for our skincare guide to The Ordinary. The Hyaluronic Acid 2% + B5 is one of their bestsellers, an incredibly hydrating ingredient which is weightless on the skin so perfect for all skin types. The Niacinamide 10% + Zinc 1% is another fan favourite, perfect for reducing the appearance of blemishes, enlarged pores and decongesting the skin. The Ordinary are constantly innovating, so expect more products to launch as they continue to grow and gain popularity. Whatever it is they launch next, you can be guaranteed exceptional products with minimal fuss. 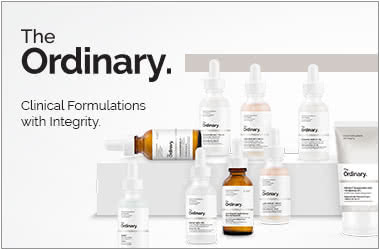 Adore Beauty is an official stockist of The Ordinary. Adore Beauty has free shipping. Showing 8 products of 48. Which is the right primer from The Ordinary for my skin type? The Ordinary Skincare Guide: What product is right for me? How do I use hyaluronic acid, and why do I need it? Great price for high active ingredients. Been using this product since Christmas last year. Skin appears healthier. Easy absorption, no fragrance and fuzz free application. When the doctor said she used this product, I am sold. Nice texture. Do use it at night time your skin will thank you for it. Did not experience any irritation but a bit of dryness after the first few uses. As much as I love smell nice products this moisturiser just does what it is supposed to, lock in the moisture with no scent. My skin used to be quite sensitive and flaky but since I started using The Ordinary products I don't experience any of those symptoms anymore.